We are a coalition of concerned New Yorkers and activists moving to push wheelchair accessibility in the subways to the top of the MTA agenda. Accessibility is not a dismissible issue. It Is not a luxury or convenience. It is a necessity and a civil right. Join our Google Groups for announcements and / or to get involved in planning our actions. Click "Apply for membership" after following the link (you must be logged in to Gmail). Through actions at subway stations, attending MTA meetings, petitioning community boards, writing letters, attending court hearings and working with other organizations, we are determined to make New York City’s transportation system more accessible. EAG’s campaign, Elevators are for Everyone demands MTA reform. The MTA must address their failure to comply with the ADA (Americans with Disabilities Act, 1990) as well as the simple economic imperative that people with disabilities are taxpayers. Wheelchair users are taxpayers. New Yorkers over 65 are taxpayers. Parents and caregivers who need to maneuver the subway are taxpayers. Delivery people are taxpayers. All these people ride the subway and need access to working elevators. While the MTA currently counts 118 stations of 472 as accessible, many are part of transfer stations that are counted multiple times. Five stations are accessible in only one direction, and five stations are in Staten Island. However, the 21 stations in Staten Island are not included in the overall total. When taking these factors into consideration, and in order to make a fair comparison to other systems in the US, the true number of accessible subway and rail stations in all five boroughs is just 90 out of 445, or 20.2%, with plans in place for 11 more stations in the next few years. See this link for a full analysis. By excluding people with disabilities from the subways, Cuomo and the MTA are complicit in rejecting our civil rights, forcing us to fend for ourselves or rely on inferior transportation options. New York City is dead last in the country by percentage of accessible subway stations.. Given the success of other old American cities in improving access to their subways, excuses like cost and age of stations are not valid. New York City is currently experiencing a breakdown of the subway due to years of neglect, and prioritizing vanity projects over basic system maintenance. New Yorkers are experiencing delays like never before, without realizing that this has been the daily reality of wheelchair users for decades. As the MTA and the State of New York grapple with bringing overall service back to the system, it is imperative that elevators are part of their long-term plans and part of ALL station renovations and enhancements in the future. Not doing so is a major liability for all New Yorkers and jeopardizes our city's future. The lead plaintiff in Center for Independence of the Disabled New York (CIDNY), et al. v. New York City Transit Authority (NYCTA), et al. (S.D.N.Y.) and part of AARRG. Also see their subway disabilities map - Here! March 27, 2019 - Honor Malaysia Goodson for Intl Women's Month! 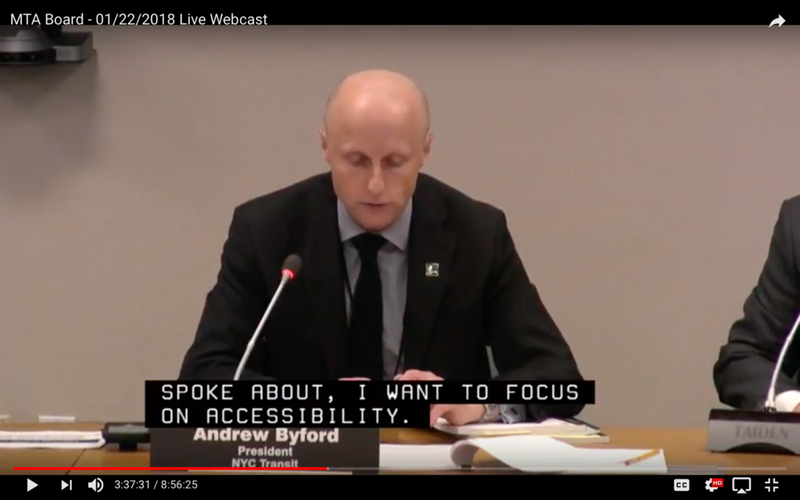 Speakers at the MTA board meeting share their stories and honor Ms. Goodson by adding their voices to accessibility rights advocates who have been calling for elevators and ramps in the subway for years. WPIX news coverage, Malaysia Goodson’s cousin speaks at the MTA board meeting. March 3, 2019 - Courthouse Rally for Subway Access - Quit Stalling, Cuomo! February 25, 2019 - Parents With Strollers Need Elevators in the Subway! The People’s MTA and disability rights activists invite parents with strollers to the MTA board’s monthly Bus and Subway meeting. February 21, 2019 - AARP + TransitCenter Rally for Accessibility. AARP-New York and the Penn South Program for Seniors will join TransitCenter in calling on the state to fund NYC Transit’s Fast Forward plan for an accessible subway. 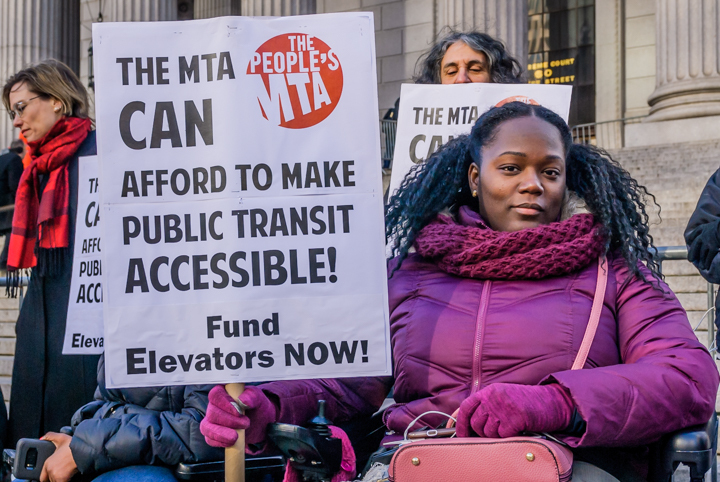 January 30, 2019 - Disability advocates rally outside the station where 22-year-old Malaysia Goodson died after falling down the steps carrying her 1-year-old daughter in a stroller, calling yet again on the MTA to sign an agreement to install elevators at every subway station. December 11, 2019 - No Fare Hike! Rally and protest at the Queens MTA Fare Hike Hearing. December 10, 2019 - Transit users and the Fix The Subway coalition rally and then testify before the MTA Board Meeting's Brooklyn Fare Hike public hearing. November 27, 2018 - MTA Fare Hike Hearing/No Fare Hike Until Subways Are Accessible! The People’s MTA and Rise and Resist held a rally in front of the venue as well as spoke at the hearing - NO FARE HIKE UNTIL EVERYONE CAN RIDE! November 12, 2018 - Press Conference to Demand that Developers Maintain Subway Elevators TransitCenter, Rise and Resist and Council member Brad Lander held a press conference calling out mega-wealthy real estate developers who manage subway elevators but don't keep them up and running. 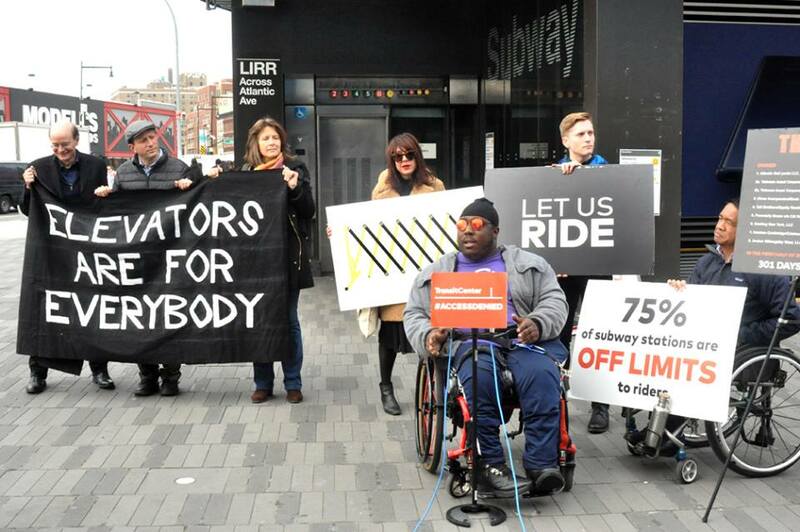 November 9, 2018 - Press Conference to Demand Subway Accessibility The Elevator Action Group joined Council Member Brad Lander, neighbors, citizens and disability advocates at a press conference to call on the MTA to add an elevator at at the 7th Ave. Station, Brooklyn. October 30, 2018 - Courthouse Rally for Subway Accessibility Rise and Resist’s Elevator Action Group and the People’s MTA called on the MTA to make a binding legal agreement to make New York City’s subway system fully accessible. 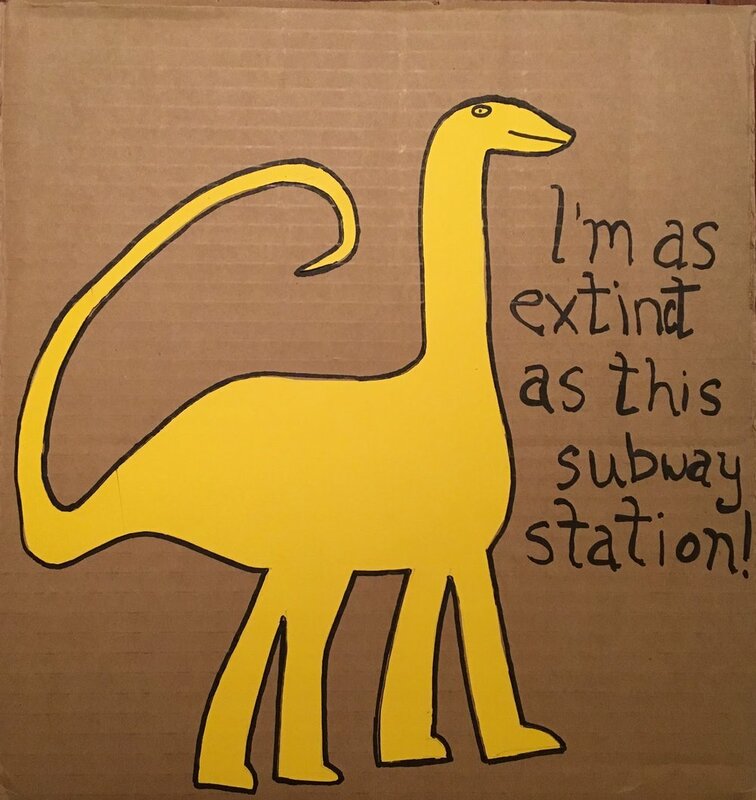 October 5, 2018 - Courthouse Rally to Demand Subway Access We are Not Backing Down from our simple, steadfast demand: Every subway station must have stair-free access -- for everyone. October 2, 2018 - Coalition to Fix the Subways Fix The Subway rally Union Sq. April 26, 2018 - "Only in New York" event at the Museum of the City of New York with MTA Chairman, Joe Lhota, was disrupted by The People’s MTA. Rise and Resist was in attendance with other disability rights protesters. CUNY Graduate Fellow Jessica Murray profiles the MTA’s failure to provide accessibility for all. Ride to Nowhere: Investigating the MTA - Documentary short by Educational Video Center about MTA deficiencies and negligence. U.S. Attorney Announces Suit Against The MTA And New York City Transit Authority For Failure To Make A Bronx Subway Station Accessible After A Full Renovation. 1. Do we endorse candidates? No, we do not. But we ask all candidates to support policies that prioritize accessibility for all. 2. Aren't elevators very expensive? 3. How many subway stations need to be made accessible? All of them, as quickly as possible. There are more than 350 stations that are not wheelchair accessible. 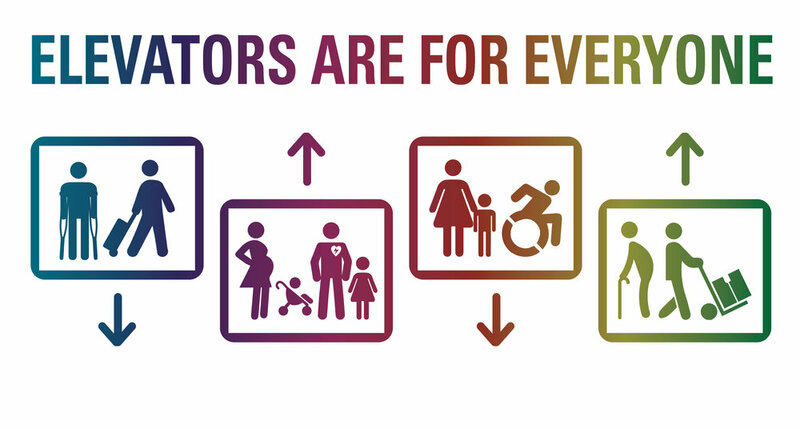 As taxpayers, we have a right to equal access to our city. A single inaccessible station is one too many. The MTA has had an abysmal record on accessibility. We want to change that through direct action and putting public pressure on our elected officials to fund accessibility improvements. 4. Aren't some stations too hard to make accessible? We are a city with literally hundreds of thousands of buildings with elevators of all shapes and sizes, going up and down dozens of stories. Given the expertise that exists here, we can make this happen. In the vast majority of cases a two-floor elevator or ramp will likely be feasible. The MTA is currently conducting a 2-year study to assess the cost and feasibility of making the remaining stations wheelchair accessible. This is the first time they have systematically assessed the whole system rather than throwing out wild guesses in the tens of billions of dollars. 5. Aren't other cities' subway systems smaller? 6. Aren't other cities' systems newer? Mostly, and new systems have the advantage of being built with wheelchair accessibility in mind. However, Boston built the first subway system in the U.S. and is now 94% accessible. Older systems in Chicago and Philadelphia are approaching 70% and 50% respectively. NYC remains dead last at 23%, embarrassingly far behind. 7. Aren’t there vans for people with disabilities who need transportation? Yes. Access-A-Ride is the MTA's paratransit service and is supposed to provide service comparable to public transportation for people who can't use the subway or buses due to their disability. Unfortunately, the current system is wildly inefficient, extremely costly, and doesn't compare to the travel times or availability of the subway. It costs more than half a billion dollars per year to provide service to 150,000 passengers, and a single ride costs more than $70 on average. While paratransit service will always be a necessity for some people with disabilities who need more help, many Access-A-Ride passengers would rather take the subway, which is the fastest way to get around town. The subway is just not a viable choice for many people because of its inaccessibility.